Half double crochet is a beautiful crochet stitch; it's simple but versatile. 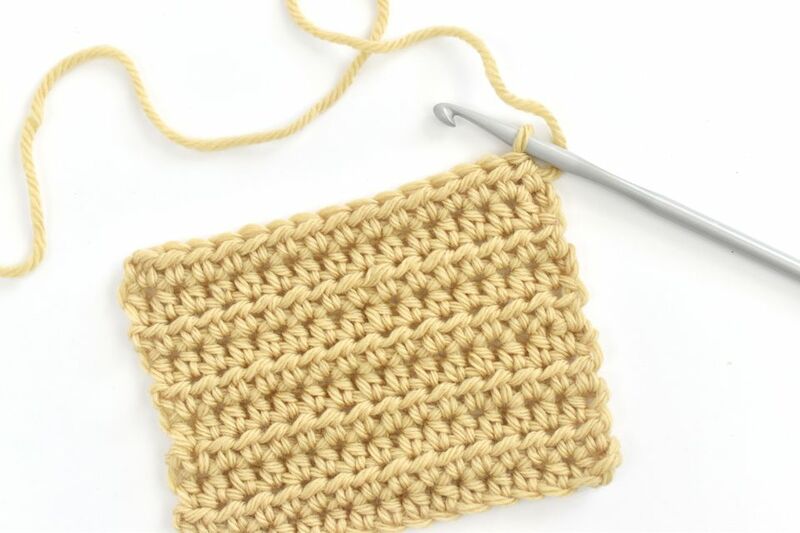 It is one of the basic crochet stitches that a beginner should master when learning how to crochet. This guide shows you how to crochet the HDC stitch and tips for working with half double crochet. Beginners who have already mastered single crochet and double crochet would do well to try this stitch next. As the name suggests, HDC is taller than single crochet but shorter than double crochet. It is a foundational crochet stitch and worked similarly to those two basic stitches. A slight difference creates a unique third loop and the smaller height. The half double crochet stitch shows up in all different types of projects, so you can use any yarn and any crochet hook to work on HDC. If you are working with a crochet pattern, the pattern will tell you the exact materials needed. If you aren't working from a pattern, choose your yarn then look at the yarn label to find out what hook size you need for that yarn. Beginners may want to try a worsted weight yarn and size H crochet hook as a good starting point. Tip: Smooth, worsted weight yarn in a light color is a good choice for learning new crochet stitches. All crochet projects begin with a slip knot. Next, make a foundation chain to work the first row into. You can crochet a foundation chain, also known as a starting chain, of any length. If you are working with a crochet pattern, use the chain length specified in that pattern. To work the first half double crochet into the foundation chain you will crochet into the chain that is three chains away from your hook. When you crochet in rows, you begin the row with a turning chain. The height of the turning chain depends on the height of the crochet stitch. In half double crochet, chain two for a turning chain. It's time to make the first HDC. Yarn over and insert the crochet hook into the stitch. Tip: Note that if you were making a double crochet stitch, you would also do this step. 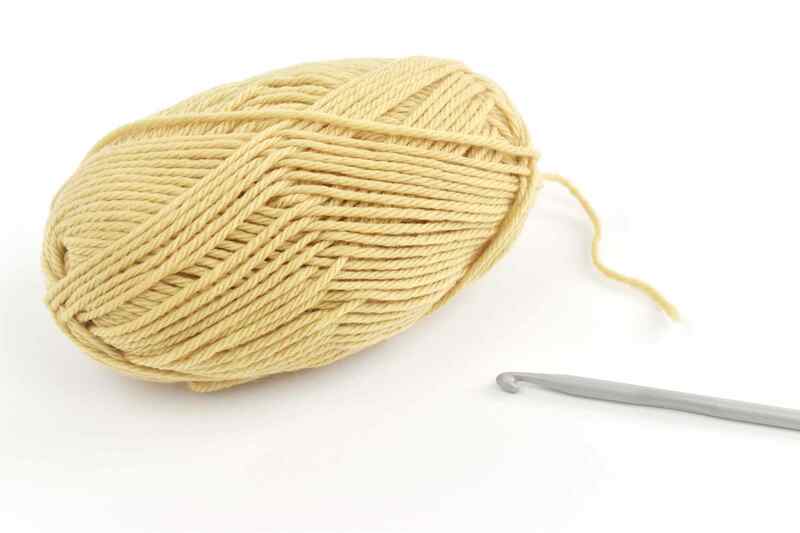 If you were making a single crochet stitch, you would not yarn over before inserting the crochet hook. The yarn over adds the height to the stitch, making it taller than the single crochet. Yarn over again and pull the yarn through the stitch. You should now have three loops on the hook. Yarn over one more time and pull the yarn through all three loops. That completes the first half double crochet stitch. Repeat the steps for each HDC, working across the row of foundation chain and across all the stitches of each subsequent row. Yarn over and insert hook into next stitch. To begin the new row, turn the work, chain two for a turning chain. Make HDC stitches in the next stitch and all the following stitches from the row before. With the basic half double crochet stitch, you can crochet any HDC pattern that's worked in consistent rows. But for patterns with shaping, you may need to know how to increase and decrease in half double crochet. Don't worry; it's easy. To increase, all you do is make an extra half double crochet stitch where you've already made one. Crochet patterns tell you how or where to do this. For example, to increase at the end of the row, crochet two HDC stitches in the final stitch instead of just the one you would usually work. Decreasing is a little different, but still easy. Yarn over and insert hook into the next stitch. Yarn over and pull through all five loops. The decrease stitch works over two subsequent stitches to bring the two stitches together at the top into one stitch. You might see it abbreviated as hdc2tog (half double crochet two together) or dec hdc (decrease half double crochet). Half double crochet is a US crochet term; it's called half treble crochet in UK crochet patterns. You can replace the double crochet stitch in many patterns with a half double crochet stitch for a shorter design that looks the same. For example, you can make a v-stitch as a HDC v-stitch instead. Half double crochet shell stitches make beautiful edging for blankets. You can change the appearance of a basic stitch like half double crochet by working into only one of the loops instead of into both of them. Half double crochet looks great worked into the back loop only for a ribbed design, but you can also work into the front loop only. Half double crochet has a third loop because of the way that it's constructed (when you pull the yarn through all three loops instead of the usual two). This means that you have to understand the anatomy of the loops better to make sure that you're correctly crocheting into the front loop or back loop. It also means that you can work into the third loop instead, a technique that creates a great knit-like fabric. Yarnspirations shows this technique in their helpful video.